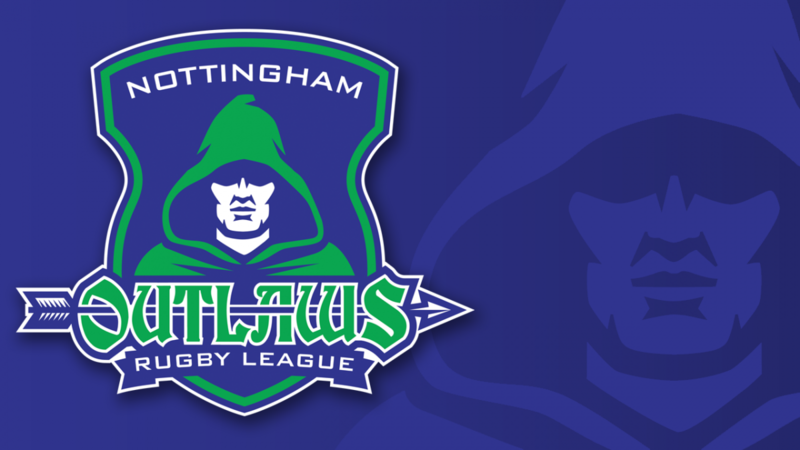 Nottingham Outlaws fell to a second successive defeat on Friday as they were heavily defeated by an impressive Bentley side, who scored six tries in their 36-0 victory. As usual, the Outlaws side showed a plethora of changes from their previous outing. The three-quarter line was made up of the returning Tyrelle Anderson-Brown and Matt Horner on one side, with debutants Mark Stockman and Jack McLeish on the other. Alex Whittle returned in the halves to partner Cunliffe, while captain Oliver Dale returned to the pack. On the bench, there were returns for Nick Tasker, Ollie Perry and James Hood. Outlaws made the worst possible start when they dropped the kick off, conceding possession on their own line. From the resultant set, Bentley forced a drop-out. From this, Bentley immediately broke, but Matt Horner made the cover tackle. However, Horner was sin binned for lying on, preventing a quick play the ball with the Outlaws line scrambling. With a man short and repeat sets on their own line, the Outlaws defence was broken as Bentley went in under the sticks for a converted try to lead 0-6. Immediately, Bentley made a hash of the kick-off and conceded possession to Outlaws from a drop-out. After a probing set, Cunliffe thought he had scored on the last with a run to the line, but the referee adjudged he’s been held up over the line. Bentley then made it a twelve-point swing, as a short side play on half way saw them break down the right, and an inside ball saw them score to the right of the sticks, with the conversion good for 0-12. Minutes later, the match was halted for 40 minutes following an injury to Outlaws Debutant Stockman who went down heavily in the tackle and required an ambulance. It later emerged that he’d suffered a heavy concussion and a slight neck injury and is expected to be out for three weeks. When the match restarted, it was the Outlaws who dominated the play with a succession of sets on the Bentley line. However, despite several close calls, the Bentley defence held out, frequently with last ditch tackles keeping the Outlaws out, leading to a half time score of 0-12. At half time, the Outlaws were well in the match, needing to take their chances and slow down the Bentley ruck speed. However, from the restart Bentley threatened the Outlaws line, only for the final pass to be intercepted. Having gained this reprieve, Outlaws worked their way back upfield, but once again found the Bentley defence able to withstand what they could throw at it. Having repelled the Outlaws attacks, Bentley took a firm grip on the match with three tries in ten minutes. Firstly, they forced their way over from dummy half, then scored with the ball being moved to the right and the Centre shrugging off an attempted tackle to score in the corner. The final try of the sequence summed up the state of play in the half. With Outlaws struggling to deal with the much larger Bentley back, a break was made in the middle before the ball was passed inside for the supporting runner to hold off the challenge and score. All three tries were goaled to leave the score at 0-30. With the game out of sight, Outlaws continued to press the Bentley line hunting for a consolation score, but that was denied them by more strong on line defence. There was still time for Bentley to register a final score. A break down the right was stopped short by good scrambling defence, but the ball was then swept left for a try in the corner, which was goaled for a final score of 0-36 as the referee brought proceedings to a close. After the final whistle, the coaching staff awarded the man of the match to Harry Walton for producing several try saving tackles. Outlaws will have to dust themselves down quickly from this result, with a trip to league leaders Batley Boys up next week.